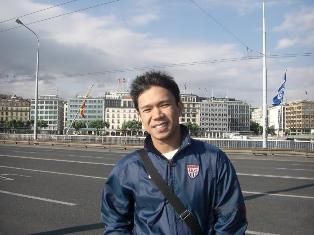 The New Humanitarian | Jerico Paterno, "My dream of working abroad and helping my family could no longer come true"
Jerico Paterno, "My dream of working abroad and helping my family could no longer come true"
When Jerico Paterno, 34, found out he was HIV positive, he thought it was the end of the world. Now the Area Coordinator of the Pinoy Plus Association, the only organization for people living with HIV/AIDS (PLWHAs) in the Philippines, Paterno told IRIN/PlusNews the story of his long road to acceptance. "December 27, 2005 is a day I will always remember. It was my 30th birthday and the day that I was diagnosed as HIV positive. I was living in Dubai then. I had moved there and, after five months, found a job as a food attendant in a restaurant. "One of the requirements for an employment visa was to get an HIV test. I didn't think anything of it - I had no symptoms, nothing to indicate that I was sick or may be a carrier, though previous to that my sexual behaviour was risky. I had a number of casual encounters with men, most of which went unprotected. "I never saw the need to wear a condom - I didn't think the experience would be as pleasurable with a condom. Besides, my partners always looked physically fit and clean. "After I was diagnosed, I was put in an isolation area in the hospital in Dubai and then sent home - you cannot work in Dubai if you are HIV positive. My dream of working abroad and helping my family financially could no longer come true. "When I came back to the Philippines, I told my family that I had AIDS and was dying - I didn't even know the difference between AIDS and HIV then - I was so depressed. There was limited information on HIV/AIDS in 2005, and I didn't know what to do or where to go for help. All I knew was that I was dying and because I thought I was going to die anyway, I didn't seek any treatment. "In 2007 the illnesses started. I got tuberculosis and later on pneumonia. Around that time, I chanced upon a small ad in a local tabloid that said those who are HIV positive could get help at the San Lazaro Hospital, a hospital that treats communicable diseases. "I went there with my father and was counselled by the hospital staff. They told me about the treatment options that were available to me. During my [stay] I met people from the Pinoy Plus Association - they were doing their hospital visits and encouraged me to join them. "I found out that Pinoy Plus is a support group dedicated to the welfare of PLWHAs, and increasing their access to information and services. I was inspired by their mission and the passion of the members; I became very active in the group. It was healing for me - my depression started to wane, my knowledge about HIV/AIDS increased and I learned how to deal with my situation. "After two years of involvement, I became the Chairman of Pinoy Plus Association. I see first-hand how effective the peer-to-peer counselling approach is - it really helps to listen to and talk to someone who has gone through the same experience. "For the newly diagnosed, I see their depression and denial; I hear their questions, asking why this had to happen to them. They are always surprised to learn that I went through the same thing. I think it gives them strength when they see someone who has been through it and is now living a happy, normal life. "Apart from my duties at Pinoy Plus Association, I conduct pre-departure seminars on HIV/AIDS for the Philippine Overseas Employment Agency (POEA). I talk to those who are about to work abroad about the dangers, and the ways that they should protect themselves. "I have a partner now - we have been in a monogamous relationship for about a year. He is also HIV positive. I met him when he went to me for counselling and accompanied him when he got tested. Our common experience drew us together; we became close and later became a couple. "I have come a long way from 2005 in terms of knowledge and self-empowerment, which to me are all little forms of recovery. There is life after a positive diagnosis."